A perfect shawl for the cooler days and nights of fall. Light and airy, just enough to take the chill off when needed, or to add a splash of color without being too heavy or hot. I chose Noro Blossom for this shawl because it really shows off the short row shaping with its self-striping qualities. 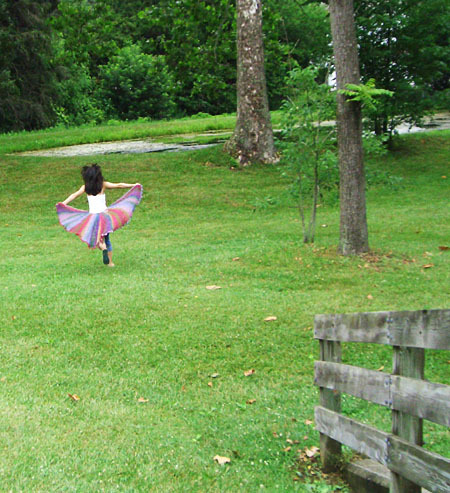 The wedges are defined by color changes. If you don't want the color-block look, use a different yarn such as Trendsetter Dune, or anything that gives the same gauge. 22 inches from neckline to bottom edge. Note: If substituting yarn, the recommended gauge for this yarn is 16 sts =4 inches. For this project, it is knit much more loosely than the recommended gauge. Using waste yarn, work a crochet chain several sts longer than the number of sts to be cast on. Starting 1 or 2 sts in from end of chain and using working yarn, pick up and k 1 st in the back loop of each st until the required number of sts have been worked. Later, the chain will be unraveled and the resulting live sts picked up. Using Crochet Cast On, CO 33 sts onto smaller needles. *K3, W&T, k to end. Place a safety pin in your work at the end of this row. K6, W&T, k to end. K9, W&T, k to end. K12, W&T, k to end. K15, W&T, k to end. K18, W&T, k to end. K21, W&T, k to end. K24, W&T, k to end. K27, W&T, k to end. K30, W&T, k to end. Repeat from * to * 8 times more; 9 wedges have been worked. BO very loosely using larger needles. Remove crochet chain from Crochet Cast On and place resulting live sts on needle, so that point of needle is at end of work marked by safety pin. (You may find that you have only 32 sts on your needle; if this is the case, increase 1 st in the first row. Work from * to * 9 times. If you plan to work the crochet edging, do not break yarn. If you plan to work a fringe instead, break yarn. Crochet edging is worked into the strands that lie between the garter bumps at the lower edge of the shawl; in the directions that follow, the strand in each of these spaces will be denoted as "space". Into first space, [sc, dc, tc, dc, sc, ch3]. *Skip 2 spaces, [sc, dc, tc, dc, sc, ch3] into third space. Repeat from * until last space has been worked. Fill a tub or sink with cool water and a little squirt of wool wash, or baby shampoo. Place shawl in the water and let it soak a few minutes. Drain the water and gently squeeze out excess water from shawl. Repeat using clean water and rinse gently. Place in a towel and gently squeeze again. If you don't have a blocking board, you will want to fold the shawl in half (front edges matching) so that you get a symmetrical shape when blocking. Lay the shawl out onto the surface that you are going to block it on. I usually pin my shawls to the spare bed in the guest room, or to the carpet, using T-pins. Place a towel or sheet down first if you want. 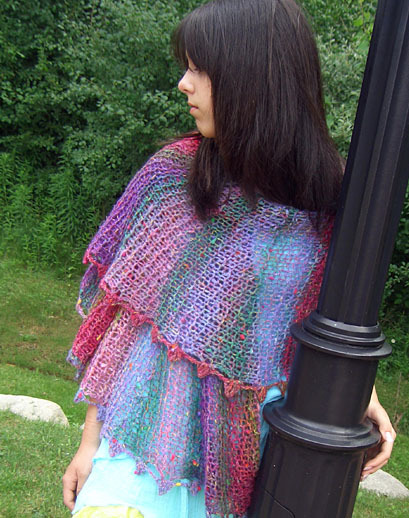 You can play around with the shape of the shawl a bit while it is damp. I like to really stretch mine as far as it can safely be stretched, making a very open, lacy look. The first time I did this I was amazed how garter stitch could look so lacy. I pin through the middle of each scallop along the edge, and this gives each one a little point as it dries. - Hang a couple of beads from each of the spaces between the scallops. 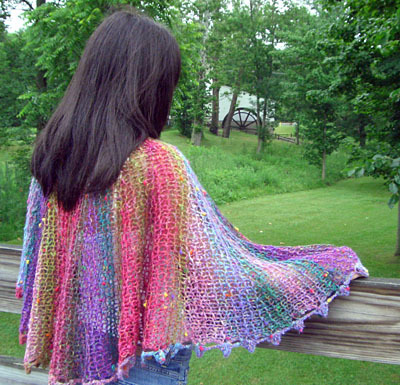 - Knit or crochet some flowers to place randomly on the shawl. Maybe felt the flowers. Put them on pin backs so they can be removed or placed differently each time you wear it. Note: A pattern for knit flowers can be found here. A pattern for a crocheted flower can be found here. - Place a vintage brooch at the neckline and let the shawl hang like a cape. - Throw one end over your shoulder and pin with a piece of great fused glass. - Use fringe instead of the scalloped border. (If doing so, weave in tail after binding off LOOSELY after your last wedge, then add fringe.) If you are unfamiliar with how to make fringe, directions can be found here. 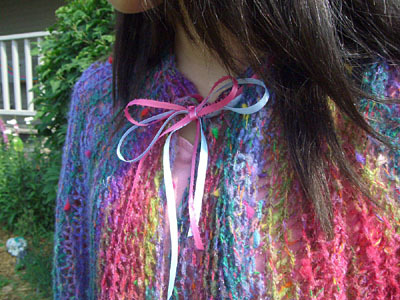 - Run a satiny ribbon through the neckline and tie at the neck. Trish (a.k.a. The Bloomin' Knitiot) lives in Michigan with her family. She recently designed, and self-published her first knitting pattern. "Bloom" is her second design. She is looking forward to more designing in the future. Trish works part time at a local yarn store, and also teaches knitting classes there. When not knitting (huh?) 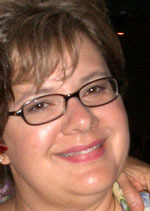 Trish likes to read, spend time online, work on her blog, and play poker.